What are the frameworks that generally come to mind in discussions of methodology in the social sciences? 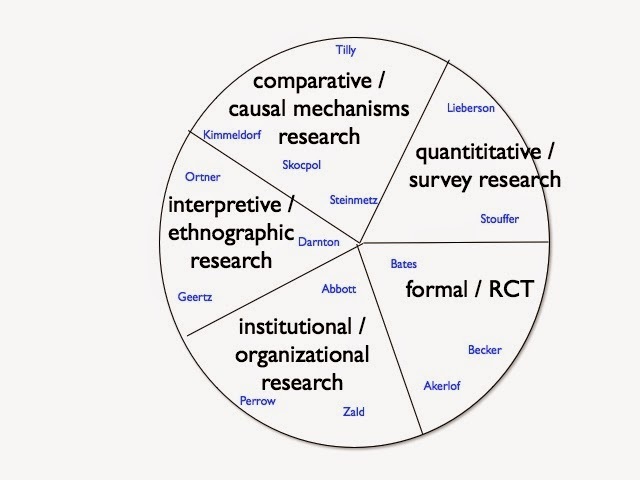 Several families of methodological frameworks are indicated in the diagram above. These are deliberately presented as a wheel, with no sense of priority among them. (A) Quantitative methodology -- what Andrew Abbott refers to as the variables paradigm. This is the approach that analyzes the social world as a set of individuals, groups, and properties, and simply sorts through to find correlations, associations, and possible causal relationships using a range of statistical tools. This is an inductivist approach. In this approach, the role of the social sciences is to accurately observe the facts and to build up systems of regularities among them. This seems like an assumption-free framework, but there is an underlying ontology here no less than the other frameworks mentioned here -- the idea that the the social world is governed by some system of underlying laws or regularities. (B) Interpretive methods. Clifford Geertz recommends an approach to social research within a generally interpretive worldview. He maintains that the most important feature of the social world is the fact of meaning. He urges us to consider as most important the meanings individuals and groups attach to behaviors and performances. So the research task is to reconstruct those meanings by observing and interacting with the social actors in a particular setting. The observer should observe the patterns of action and interaction he/she finds and carefully investigate the patterns of meaning the participants weave around their worlds. A related framework is ethnomethodology, the approach taken by qualitative sociologists like Goffman and Garfinkel. This is the idea that one important function of the social sciences is to figure out the underlying grammar of the assumptions and rules that individuals are following as they interact with each other. The ontological assumption here is that individuals are basic in the social world, and individuals are complex. On this approach the methodology is to observe ordinary behavior and try to discover the underlying rules and expectations that indicate something like a grammar or normative frame that drives or generates interpersonal behavior. (C) A family of approaches we might call realist methodology. These approaches begin with the premise that the social world consists of certain kinds of entities, forces, and processes, and then guides the researcher to attempt to discover the characteristics of those structures. This is a process of hypothesis formation and theory development and of testing out theories -- large or small -- of things like class, charisma, or bureaucratic state apparatus. 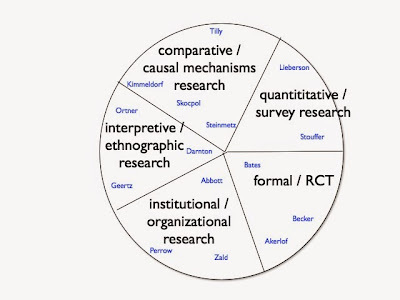 (D) A number of methods of analysis developed in the comparative social sciences, including causal methods associated with comparative historical sociology. That includes the methods of paired comparisons, Mill's methods, and methods of similarity and difference. The researcher attempts to work out which factors are necessary or sufficient, enhancing or inhibiting. We can call this comparative methodology. (E) Causal mechanisms methodology. This framework is a variety of realist methodology. On this approach we work on the assumption that there are social causes and that causes take the form of concrete causal mechanisms. The task of research is to gain enough empirical detail about selected cases to be able to piece together assumptions about the mechanisms at work. Ideas associated with the notion of process tracing have a natural fit here. (F) Methods emphasizing techniques of formal modeling. This methodology is especially prominent in political science and economics. Here the goal of the research is to arrive at elegant, simple mathematical models of the phenomena. On this approach the evaluation of the model is not so much empirical but rather mathematical and formal. This approach is commonly faulted exactly because it is not sufficiently responsive to empirical constraints do standards. Its empirical relevance is not so clear. If we believe the social sciences are empirical then a formal model that is a valued for its abstract elegance is unsatisfactory. It needs to contribute to an understanding of real empirical phenomena. At the least this means that we should be able to tie the model to some real behavioral characteristics. In the best case -- for example, with ABMs or CGE models-- we should be able to begin to reproduce important features of real empirical cases by calibrating the model to empirical circumstances. (G) There are two other aspects of methodology that need to be called out. One has to do with the methods of data collection which are recommended, which differ substantially from domain to domain. The other is methods of empirical evaluation of the theories we advance. Social sciences differ substantially in both these ways -- what kind of data is needed, how it should be collected (e.g. survey methodology), and how we should validate the results. These are often discipline-specific and substantially more concrete than prescriptions in the philosophy of science. The ways in which we should evaluate a social science construction also varies significantly by national research tradition. Gabriel Abend points out that schemes of evaluation vary substantially across the sociological traditions of mexico and the United States in terms of the standards in play about what constitutes rigor,empirical argument and theoretical argument." Each of these is a methodology in the loose sense I favor. 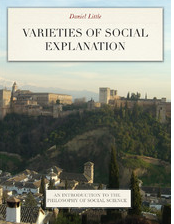 It is a guide for the researcher, indicating what kinds of factors he or she should be looking for by postulating a social ontology; an indication of what an explanatory account ought to look like, and an indication of what counts as warrant for such explanations. We might observe that if we favor a pluralist social ontology, according to which there are properties individuals, relationships, structures, networks, meanings, and values, then the method we use to acquire knowledge about these things should be pluralistic as well. Our methods should allow us to pose research questions about all these kinds of things.